Pour the desired amount of STYNYLREZ primer into the airbrush color reservoir. 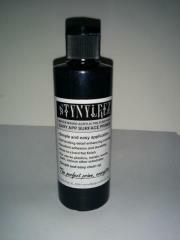 If using a bottom feed airbrush, attach jar containing STYNYLREZ to the airbrush. Holding the airbrush 4-6" (10-15cm) from the item you are priming, apply STYNYLREZ in even coats over the entire surface of the item. Apply in light coats, building the primer up until the entire surface of the item is covered and the items actual color is hidden. Check all areas and re-spray any light areas or any areas where the items actual color is still detectible. Let dry 5 to 8 minutes (3 minutes if dried with an artificial heat source). Your item is now primed and ready for painting. Clean your airbrush by immediately.